We can sell anything on the internet, but at what price? Like New is a short road movie about this crazy Dutch addiction to buying & selling unnecessary stuff via eBay and on the King’s Day. “If you take off any of your clothes, mom will take a picture and sell them online”. “Can you keep a secret? Mom didn’t sell your teddy bear. I buried it in the garden, together with your favourite pyjamas”. Original Dutch title is Z.g.a.n. (Zo goed als nieuw) which means “condition: like new” in classified ads. The main scenes of Like New were shot in sequence during one long day. So, the lead actor was really happy to get rid of the ironing board and weights in the final scene. All items in the film were actually placed on eBay (called Markplaats in the Netherlands). Some were sold after filming, including children clothes and one of the remaining weights. There was no interest for the ironing board. 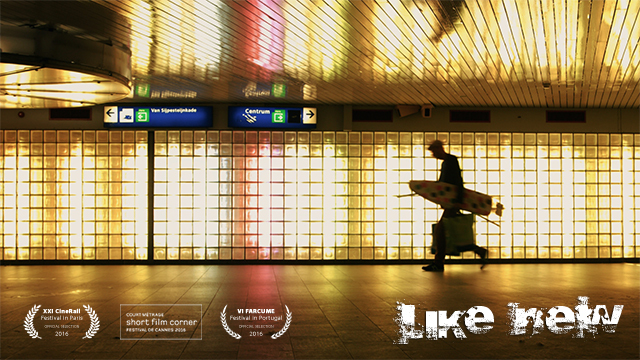 Like New is part of a diptych with LIKES, a short film about true reasons why we use social media. Both shorts explore a new virtual reality created by digital media, reality that feels more real than the physical world where we live. Both films are written by Artem Golikov and directed by Serge Fenenko. Like New / Z.g.a.n. was selected by the following film festivals: XXI CineRail Festival in Paris, Short Film Corner/Court Métrage of the 69th Cannes Film Festival, VI Farcume Festival in Portugal.